A yearlong, $12-million hotel renovation project was just completed at the Wyndham Houston West Energy Corridor. The 344-room Houston hotel, which is in close proximity to major employers including Shell Oil Company and BP America, features 344 rooms and 9,000 square feet of meeting and event space. “The new interiors are up-market, distinctive, fresh, modern, serene, memorable, and within the lobby, thoughtfully planned to foster guest interaction,” says Bill Rooney of Bill Rooney Studio. 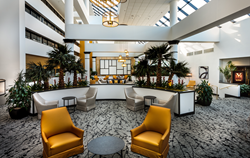 The Wyndham Houston West Energy Corridor hotel has just completed a twelve-month renovation focusing on interiors and guest experience enhancements. The $12-million Houston hotel initiative was recently unveiled at a by-invitation cocktail preview, drawing hundreds of neighbors and clients to the 20-story, 344-room property. The hotel renovation project has completely changed the look and feel of the Energy Corridor District landmark, which was originally built in 1982 as a Holiday Inn Select and reflagged as a Wyndham in August 2012. In addition to a striking, contemporary makeover of public spaces and guestrooms under the direction of noted, New York-based firm, Bill Rooney Studio, upgrades have included sealing windows for efficiency and noise reduction, the modernization of elevators, plus the replacement of the boiler, chiller and HVAC. To complement the entirely fresh and up-market sensibility of the food and beverage outlets – which includes Park Restaurant & Grille, Ten Bar & Lounge and Another Perk coffee and sundries boutique, plus a 9,000-square-foot meetings and events wing – Four Seasons Hotels and Resorts alumni, Patrick Havard, was hired as Executive Chef in April. Most recently Executive Chef of the famed Hotel Galvez & Spa; a Wyndham Grand Hotel in Galveston, TX. Havard is in the process of overhauling all of the property’s menus. Havard’s selection follows a year of key staff hires aimed at repositioning the Wyndham Houston West Energy Corridor while bringing the guest experience in line with the needs and expectations of the increasingly discerning and global clientele drawn to the Energy Corridor District – one of the country’s fastest growing submarkets – as well as its predominantly high-end residential communities that bridge west Houston and suburban Katy, TX. “We are thrilled to re-introduce the Wyndham Houston West to business and leisure travelers at a time when our location is booming from business commerce, as well as a wealth of new leisure offerings,” says General Manager Chris Miller. “Additionally, with an influx of companies and residents to the area, we are also now prepared to support a myriad of social and corporate meetings and events. Our Count on Me! Service culture permeates throughout the building and while the renovation is over, our work to perfect our guest experience continues,” he adds. According to the project team at Bill Rooney Studio, the design was influenced by Houston as an energy and technology center that is innovative, modern and thriving. The sophistication of the city is celebrated through the use of rich colors and textures and industrial lighting. Gold is used as key accent that is juxtaposed against a calming gray, black and white background. In the soaring lobby, a signature venue that incorporates a new reception area and lounge, which is also utilized for functions, gold-painted walls provide a foundation to the atrium above, while further enhancing the height, light and volume. Fixtures created from raw steel add scale, illumination and hierarchy to the space. The front desk surround mirrors a screen that separates and defines the lobby from the indoor pool. In the guestrooms, a soothing palette of blues, browns and whites plays off a geometric carpet, statement headboard, contemporary lamps and abstract art. 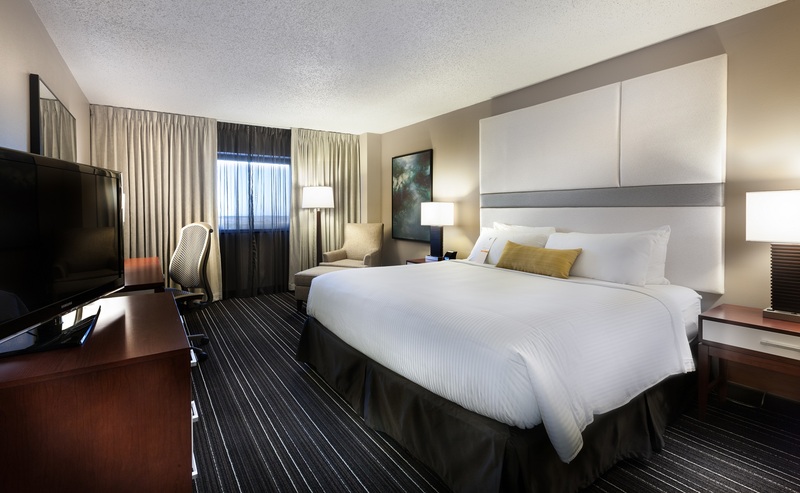 Guests enjoy premium bedding and linens, large desks with ergonomic chairs, plush arm chairs with ottomans, 40-inch flat panel TVs and revamped bathrooms with eye-catching vanities incorporating back lit mirrors and quartz counters. In addition to the indoor pool, recreational space includes a state-of-the-art wellness center with adjacent jacuzzi and sundeck. Pool tables, shuffleboard and a Nintendo Wii station make clubby Ten Bar & Lounge a popular retreat from happy hour until late into the evening. Wyndham Houston West Energy Corridor is located at 14703 Park Row. For property information and reservations, call 281.558.5580 or log onto wyndhamhoustonwest.com. EDITORS NOTE: high resolution images available here. Please credit T Foteh.